Sebelius Calls For Review Of HHS Practices That Led To Debacle : The Two-Way "The launch of HealthCare.gov was flawed and simply unacceptable." Those are the words of Health and Human Services Secretary Kathleen Sebelius, published today, just before she spent time with people who share that view: members of the House Energy and Commerce Committee. "The launch of HealthCare.gov was flawed and simply unacceptable." Those are the words of Health and Human Services Secretary Kathleen Sebelius, published Wednesday just before she met with people who share those views: members of the House Energy and Commerce Committee. With her agency under fire since the website's failed release last month, Sebelius announced an internal inquiry and other steps that will focus on improving the contracting process, project management and employee training. "I believe strongly in the need for accountability, and in the importance of being good stewards of taxpayer dollars," Sebelius wrote in a blog post ahead of the hearing. Those dollars run in the billions. With the agency's Centers for Medicare & Medicaid Services division spending $5.3 billion on contracts in 2013, Sebelius said, HHS is the third-largest contracting agency in the federal government. Asking HHS Inspector General Dan Levinson to review the development of HealthCare.gov, focusing on how the contractors were chosen, program management and contractor performance, in addition to payment issues. Creating a new position of CMS chief risk officer, who will focus on mitigating risk across CMS's programs. Sebelius will seek recommendations from the risk officer within two months. Update training for CMS employees on best practices for contractor and procurement management, rules and procedures. "The administration originally hoped to have 500,000 people enrolling in coverage in October alone," NPR's Scott Horsley reported this morning. "As it is, there were only about 365,000 enrolled by the end of November." The Associated Press reports that as a result of the new system, "an additional 803,077 people have been determined to be eligible for Medicaid, the safety-net program shaping up as the health overhaul's early success story." 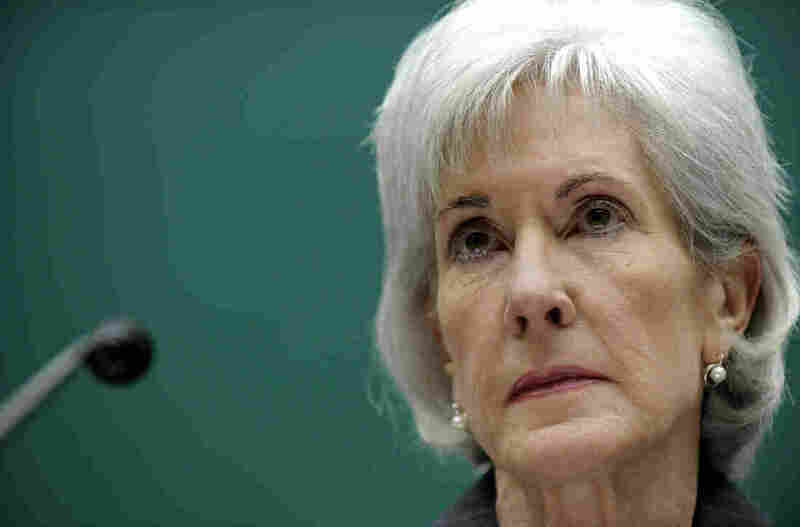 The website's problems, and the new health care system's unwelcome changes to some Americans' policies, have exposed Sebelius to regular criticism from Republicans and Democrats in Congress. Sebelius faced a barrage of questions from the House Energy and Commerce Committee, in a session that sometimes saw members yelling over one another. One heated exchange took place with Rep. John Shimkus, R-Ill., who was eventually upbraided by his colleagues for peppering the HHS secretary with questions and not allowing her time to respond. Shimkus said the new federal system is putting an undue burden on Medicaid. He also sought a promise from Sebelius to provide a list of insurance policies that include abortion coverage (a topic he's asked her about before). As Sebelius sought to answer his questions, Shimkus responded by saying, "It's like talking to the Republic of Korea or something." That remark might raise eyebrows in South Korea, the U.S. ally whose formal name Shimkus invoked. We presume he meant to allude to the Democratic People's Republic of Korea, the famously opaque and enigmatic country known as North Korea. Soon afterward, Shimkus' questioning was ended by the rapping of the chairman's gavel, as his time had expired. The last time Sebelius appeared before the same panel, at the end of October, the HealthCare.gov website was found to have crashed. Sebelius is in a complicated situation, in which she seemingly remains in good standing with President Obama even as her agency endures criticism from the White House. As Politico notes, "when Jeff Zients, the management consultant the White House recruited to head the website repair efforts, declared the fixes largely successful at the end of November, he suggested his team had discovered 'weaknesses in how the project was being managed' — comments that were hard not to read as a slap at the oversight that took place under Sebelius, or at least on her watch."